New Salem Baptist Church in Sevierville. Earliest surviving brick church in the county. This 1886 church is Sevierville’s oldest surviving public building and the only church in Sevier County to be built for and by its African-American congregation. “Isaac Dockery, an African American brickmason and builder, was born a freeman in the Jones Cove community of Sevier County. Dockery moved to Sevierville before the Civil War, where he worked as a merchant clerk in the home of Henry M. Thomas. During the war, Confederate soldiers captured Dockery and dragged him through the streets of Sevierville because he refused to reveal the hiding place of Thomas’s grandson, McKendree Porter Thomas (1835-1913), a colonel in the Union army. After the war Dockery married Charlotte Thomas (1838-1913), who had been one of Thomas’s slaves.In the late 1860s Dockery built a brick kiln near Middle Creek outside Sevierville and established a brick masonry business. Dockery inscribed his initials, “I D,” and sometimes a date, on his bricks as a trademark. A master brick mason, Dockery taught his craft to his sons, his sons-in-law, and his grandsons. Dockery made the bricks for several notable Sevierville landmarks, including the Murphy College building (1891), the Sevierville Masonic Lodge (1893), and the Sevier County Courthouse (1896). He also built at least two commercial buildings on the original public square which were destroyed in a 1900 fire. The New Salem Baptist Church, built in 1886 for the local black community, remains his most significant building. This handsome Gothic Revival-style church was originally constructed as a Union Church, which welcomed all religious denominations. The New Salem Baptist Church is the oldest remaining building in Sevierville and the second oldest church building in the county. This route follows the Little Pigeon River to Trillium Gap. No trucks, trailers or RVs are allowed. The road leads to the John Messer Barn and the trailhead to Ramsay Cascades, arguably the best waterfall in the Park. The hike is 8 miles roundtrip and is challenging. A lesser visited area of the Park, the Greenbrier section is one of our favorites. Besides the Ramsay Cascades, the visitor has the opportunity to view large stands of virgin growth such as northern red oak, eastern hemlock, and red maple. In fact, the Great Smoky Mountains are home to 21 champion-size trees. When the Park was created in 1934, old-growth forests were saved from the lumber companies and preserved for Smokies visitors. To get to Greenbrier Road, leave Gatlinburg at light #3 and head east on Hwy 321. Travel for approximately 7 miles and turn right on Greenbrier Road. If you include the hike to Ramsay Cascades, expect this tour to take upwards of 5 hours. You can easily leave the road and walk down to the river and walk on the large bolders to get right in the middle of the river and little waterfalls. There are a lot of areas to swim in or just sit on a rock and enjoy the beauty of nature at its best it is so very relaxing. There is also some great hiking trails. The Porters Creek Trail is one of the best known trails for spring wildflowers. There are often lots of butterflies and many varieties of birds to enjoy. You will find creeks, some historical areas and a small picnic area. If you come ot the Smokies for peace and quiet, they can often be found at Greenbrier. 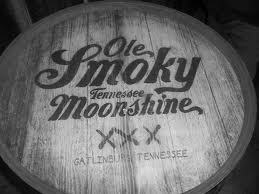 It is legal to buy Ole Smoky Moonshine at your local liquor store. The product is offered by the makers of the television show, Moonshiners, through the Ole Smoky Moonshine Distillery, located in Gatlinburg, TN. There are likely a couple flavors available, but the 100 proof Ole Smokey moonshine is a good choice. It is a little higher in octane than most other spirits and from the show. For under $20, you can purchase a 750 ml bottle. Sold in a Mason jar, the flavor is bold. It taste just as you would expect moonshine to taste. You will feel like you could breathe fire directly from your mouth. 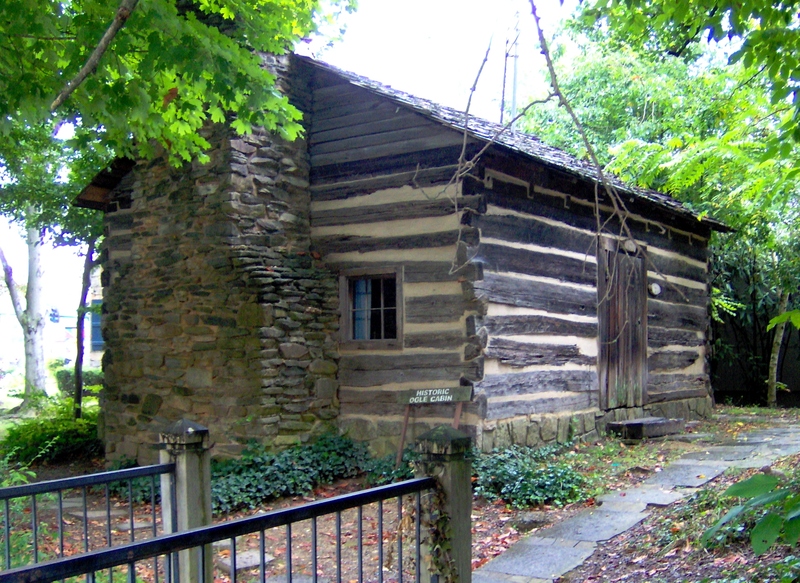 Gatlinburg, Tennessee is a place which boasts a very rich history. Of course, all the attractions and shops lining the Gatlinburg Parkway are fun, but behind all the touristy stuff lies quite a few historic sites you can visit to experience the essence of what makes our quaint Smoky Mountain town so special. The Ogles modern day descendants own most of the land around Gatlinburg. The business you see are mostly long term ground leases, not Fee Simple ownership of the land. The nature trail behind the house is very beautiful and peaceful (the trail head says easy, but is rocky). The streams and creeks are very relaxing to hear. We had a hard time finding this cabin. It is right at traffic light number 6. This is a big intersection where the Aquarium and the bar Draft’s is. If you take the trolley and get off at the Ripley’s Aquarium, you will see a gift shop across the intersection. To the right of the gift shop there is the cabin hidden by some trees. We did not see a trail. 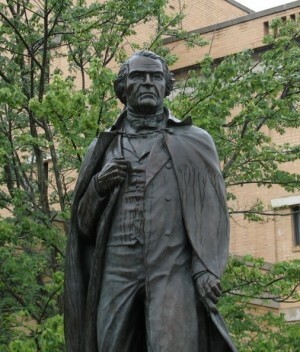 Andrew Johnson was presided over the American government during the turbulent years immediately following the Civil War. He did not fare well, nearly becoming the first president removed from office by Congress. The Andrew Johnson Historic Site in Greeneville is a place that puts in perspective his life and the era in which he lived. The “site” actually consists of several things, including a visitor’s center, Johnson’s tailor shop, the two homes in which he lived for most of his life (when he wasn’t in Washington or Nashville), and his grave. One of the things that makes the site a treasure is the fact that, compared to most presidential homes, the things surrounding the properties haven’t changed much in appearance since Johnson lived here (compared to, say, The Hermitage in Nashville). In Greeneville, you feel like it hasn’t been that long since Andrew Johnson was there. This is about an hour and a half drive from the Pigeon Forge area, but I am a history buff, so I added this in my blog. “A Walk With The President” is a tour brochure provided for those interested in walking or driving on a self-guided tour that allows you to see the sites that were once very familiar to President Johnson. Through an agreement between Main Street: Greeneville and the U.S. National Park Service, walking tours of historic points in downtown Greeneville are offered from April through October. Tours depart from the General Morgan Inn’s lobby at 9:30 a.m. Call Main Street Tours at 787-0500 for more information. 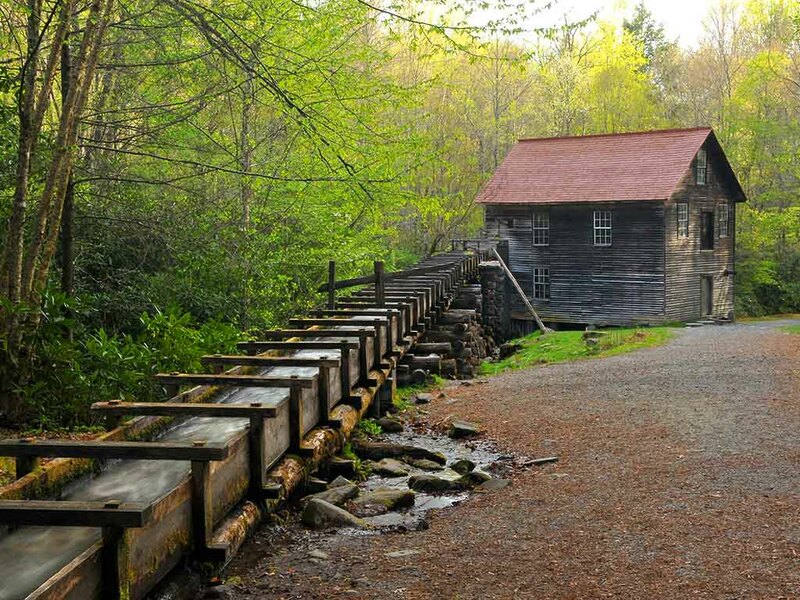 Just a few hundred feet off of US441, and just a 1/2 mile north of the Oconaluftee Visitor’s Center you’ll find the Mingus Mill. The mill still works and is water powered (it is not a water wheel). The Park Service Volunteers grind both wheat and corn and sell the fruit of their labor. Youngsters will have a great time heading upstream from the mill to play in the water. The mill itself, and nearby creek are both highly photogenic. There are usually lots of butterflies and dragonflies in the area as well, allowing for many nature shots as well. Hawks and other birds can also be found in the mill area. I would suggest going to Clingman’s Dome and this mill all in one day. It’s not the kind of thing you make the whole trip to go to, but if you’re there, it’s worth stopping. Lots of wildflowers, wildlife and historic buildings along the way. It is a short easy walk. It is also educational. Take this interesting tour to see the sites and places that played an important part in Dolly Parton’s early years and early career. 103 Joy St. Sevierville, TN 37862 – The Pines Theater was Sevierville’s first movie theater. Opened in 1944 with capacity just over 700, the Pines featured first run movies, action movie double features and Saturday westerns. The Pines also offered live shows on Friday nights. Dolly Parton also gave her first performance to a paying audience here in the mid 1950s during a “Cas Walker Amateur Hour” show. The Pines Theater closed in 1957, and the building is now home to BJ’s Florist and the Smoky Mountain Area Rescue Ministry Thrift Store. However, Dollywood has created a tribute to the Pines Theater in their Jukebox Junction area of the park and offers live shows daily. 126 Court Ave # 202 Sevierville, TN 37862 – The statue is a life-size bronze, part of a 28-stop downtown walking tour of Dolly’s hometown. Nearly everyone claims to know her personally. Under a shady tree, the figure by artist Jim Gray depicts the young, starry-eyed Dolly, barefoot, sitting on a rock with her guitar. Her father would often go downtown in the evenings to clean the statue honoring his little girl located on the courthouse lawn. 441 Parkway Sevierville, TN 37862 – Today’s Goodwill store in Sevierville, TN was yesterday’s Cas Walker Grocery store. An East TN legend, Cas Walker was known for his outlandish publicity stunts like throwing live chickens from the roof of his grocery store, dropping coupons from a crop duster plane and burying daredevils alive in the parking lot. Cas Walker is also known for giving Dolly Parton her start – and her first paying gigs – on the Cas Walker Amateur Hour show at The Pines Theater in the mid 1950s. 1200 Dolly Parton Pkwy Sevierville, TN 37862 – Sevier County High School is the alma mater of Dolly Parton. A 1964 graduate, Dolly was a member of the SCHS marching band, in which she played the drums. 1020 Dollywood Lane Pigeon Forge, TN 37863 – In 1986 Dolly partnered with the Herschend family to create Dollywood Theme Park in Sevierville. Dolly had a desire to do something for the people of her hometown. The theme park was a way of creating many new jobs, enhancing tourism, and offering both entertainment in her hometown and opportunity for entertainers to have a stage to develop their own talents as she had in Sevierville, Tn.